The moving process is stressful enough as it is for people, but imagine how stressful it is for your pets. Animals can get easily stressed, especially when they’re introduced to new environments and unexpected activities. To keep things as calm as possible for your furry friends, keep the following tips in mind. Put together a kit of all of the essentials for your pet that you will need to utilize during your first few days/nights in your new home. Think kitty litter, leashes, food, toys, and grooming tools. This will help you avoid any stress trying to find these things among your boxes at the last minute. If you’re moving out of the area, you’ll want to contact your vet to receive any prescriptions and medications for your pet, ensure all of their shots are up to date and ask for vet recommendations in your new area. Packing boxes, moving belongings around in your house, and having strangers coming in and out to pack up the moving trucks can be extremely stressful for animals. If you’re unable to kennel your pet for a few days, see if a friend can watch it. If this isn’t possible, keep your furry friend in a quiet space in your home away from all the action and loud noises. Don’t forget to check in on them regularly and keep their typical routine with feedings, walks, and play time as you would on any normal day. When the time comes to transport your furry friend to your new place, be sure to move them in your vehicle or one that they are very familiar with. This will ease the nerves and reduce stress. If your pet isn’t as good with transitions, we suggest placing them in their crate in the back seat or trunk of your vehicle and throwing a blanket over it so they can’t see the environment around them changing. 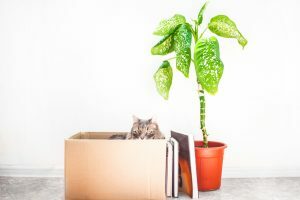 If you’re able to, unpack a majority of your belongings in your new home before you introduce your pet to the new space. The smells of your things will help them get acquainted faster and the less boxes that are laying around, the less stressful the transition will be. Being in a new, unknown area can be overwhelming for pets and more often than not, they’ll try to escape to simply adventure around or to try to get back to their old home. Keep a close eye on them at all times, always use a leash, and be sure to update their info with your new address and phone number.